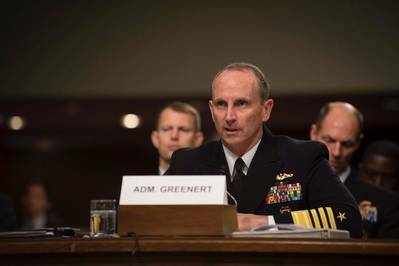 Chief of Naval Operations Adm. Jonathan Greenert has assured members of the Senate Armed Services (SASC) Committee on the survivability of the littoral combat ship (LCS). Alongside Secretary Ray Mabus the two defended the need for 52 small surface combatants in front of the SASC and in front of media following their testimony. The secretary emphasized how LCS costs have been driven down and Greenert responded to questions on LCS survivability, informs CNO Public Affairs, Washington. The three elements of survivability are: susceptibility, the ability for a ship to defend itself; vulnerability, the effects of an initial casualty on a ship; and lastly recoverability, the ability for a ship to conduct damage control, said the admiral. Responding to U.S. Sen. Carl Levin and media, Greenert explained that LCS meets or exceeds the same standards of those elements of survivability and recoverability. He said the attributes of survivability in the LCS is comparable to frigates and better than the ships it is designed to replace such as mine countermeasures (MCM) and patrol craft (PC). "We can work on the susceptibility, and we do have a plan in place," said Greenert. "I want better survivability. The LCS is an important small surface combatant the Navy needs now and in the future," said Greenert. Although he supports the overall LCS design, he indicated he is open to modifications that would increase both survivability and flexibility of the platform. In responding to more questions about the need for a small surface combatant, Greenert described that the next ship after LCS could look quite different although maybe the same LCS hull. Greenert compared it to the evolution of Hornets and destroyers. He pointed out that the Navy is coming up on a fourth flight Arleigh Burke destroyer which the Navy is very, very, satisfied with. Another aspect about LCS that was highlighted in the hearing is that LCS is a validated requirement that meets the mission it was designed to do. This point was brought up by Levin. Soon after the hearing the Director of Surface Warfare, Rear Adm. Thomas Rowden, confirmed this with interested media. "There's no doubt we're continually learning more about how we can best employ the ship as part of the integrated force, but the bottom line is that it meets the mission it was intended to do," said Rowden. "We have to remember that the overarching question when looking at survivability is 'how are we going to operate these ships?' LCS has a validated set of requirements - and it meets them."